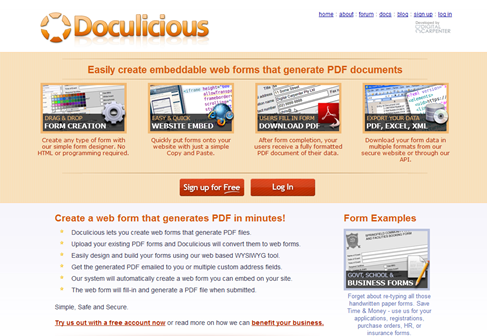 Doculicious – Easily Create Embeddable Web Forms that Generate PDF Documents | Cool Design Show | All Free Web Resources for Designer - Web Design Hot! 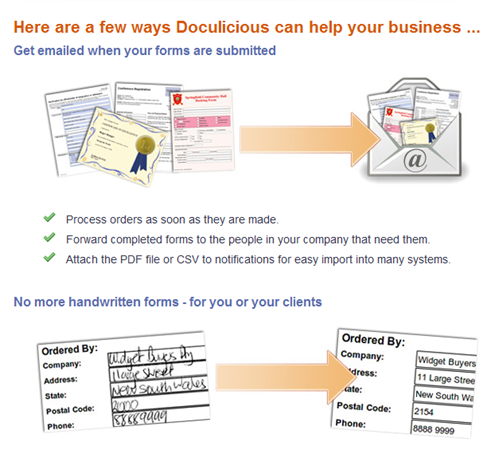 Doculicious is an online service enabling any person who has a website to add forms that can be filled out online by his visitors by providing embeddable PDF documents. The application has been designed with a purpose to allow people create formatted, graphical documents within their browsers thereby making it possible for them to fill out online forms easily. You can easily upload existing PDF forms or images of forms and have a lot of the work done for you. The application lets you design a document using an online WYSIWYG designer, the system then creates a web form which can be embedded onto external websites or co-branded and accessed from doculicious.com. When you complete the web-based form, a PDF download of the file can be printed out by the user. Once the form filling is completed, a notification is sent to the webmaster informing him that the file is ready for processing that way keeping the information of the users secure on the webmaster’s account. In addition, the forms are customizable allowing the webmaster to make changes in order to match the style and design of his site. This makes for easily tracking, managing and processing form entries, and the implementation of such a system doesn’t entail any significant structural change to the way a business is run. 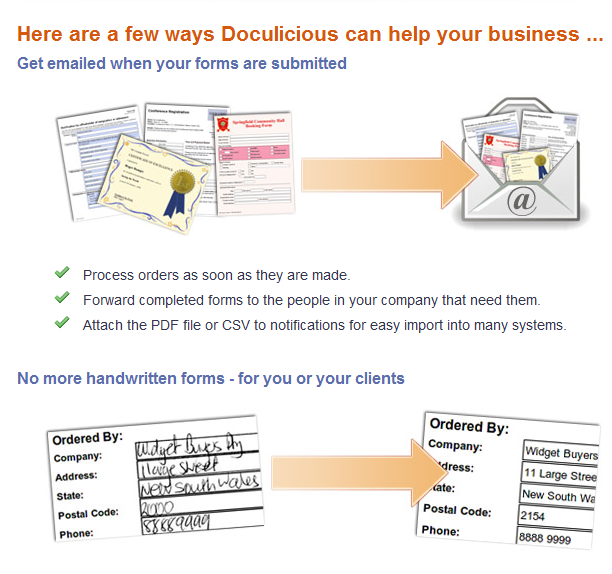 Doculicious is available in free as well as paid plans. The free plans has limitations on the number of documents you can create, number of times these can be filled and downloaded, the storage space you get and some other features. All template fields are stored as text in the database and retrieveable in multiple formats – PDF, CSV, XML, JSON. Simple Insert API for creating PDF’s using your own web forms. This entry was posted on Thursday, June 9th, 2011 at 11:30 pm and is filed under Cool Design Show . You can follow any responses to this entry through the RSS 2.0 feed. You can leave a response, or trackback from your own site.